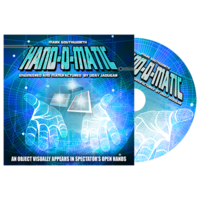 Today, when you order "Handomatic (DVD and Gimmick) by Mark Southworth - DVD", you'll instantly be emailed a Penguin Magic gift certificate. You can spend it on anything you like at Penguin, just like cash. Just complete your order as normal, and within seconds you'll get an email with your gift certificate. IT VISIBLY APPEARS ON A SPECTATOR'S OPEN HAND!!! YOU NEVER TOUCH HER HAND IN ANY WAY. AND YET...WHEN YOU ACTIVATE A SECRET SOMETHING A CHOSEN CARD (OR BUSINESS CARD OR CREDIT CARD) AUTOMATICALLY FLYS THROUGH THE AIR AND VISIBLY APPEARS IN HER HAND! EVERYONE KEEPS ALL EYES FOCUSED ON HER EMPTY HAND...THERE'S NOWHERE TO HIDE...AND STILL THE CARD INSTANTLY APPEARS ON HER HAND! 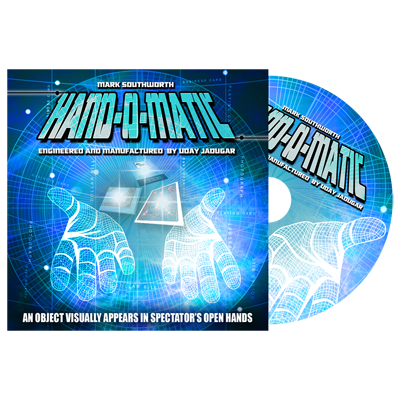 HANDOMATIC IS TRULY A GROUND BREAKING DEVICE WITH AN AUTOMATIC ONE-OF-A-KIND METHOD THAT'S AS SURPRISING AS THE EFFECT! EVERYTHING IS SELF-CONTAINED AND READY TO PERFORM ANY TIME YOU FEEL LIKE IT! Just activate the secret something and the object appears. Start and finish clean anytime during your performance. Perform sitting, standing, and semi-surrounded. No clothing restrictions. Wear anything. Nothing to attach or connect to the table or spectator. No "time delay". You control when the object appears. 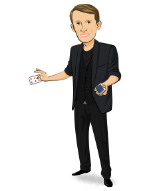 Use a playing card, business card or credit card. The HANDOMATIC GIMMICK is elegantly constructed with the best materials, and designed to last a very, very long time. COMPLETE WITH CUSTOM LEATHER-ENCASED HANDOMATIC GIMMICK AND DVD. This is a very clever effect ,GREAT OUTSIDE THE BOX THINKING from Mark yet again and one of the best ways to give out a business card ,, !!! overall its a great product because its very easy n practical ... highly recommend it !